That's $25k cheaper than a base Challenger Demon. We’ve already reported on Ohio dealer Lebanon Ford’s modified and powerful Mustangs before. For not an insane amount of money, buyers are getting one hell of a muscle car. For example, it already offers the ludicrous 727-hp, Challenger Hellcat-rivaling Mustang for $40,000, as well as the twin-turbo, 1,200-hp Mustang for just $45,000. And now comes this: the LFP 10, a $60,000 Mustang GT that’s capable of running consistent mid-10 second quarter miles times. The dealer claims it puts down up to 700 wheel hp (850 crank hp) on 93 octane fuel. It’s really one hell of a bang-for-your-buck temptation. To make that drag strip time possible the LPF 10 is equipped with a Stage 2 Roush Supercharger, new fuel injectors, high flow air filter, crank shaft, timing gears, a larger oil pump and increased cooling capacity. There’s also Viking adjustable shocks, BMR drag springs, Race Star Wheels (17x5 front, 17x10.5 rear), and a bolt-in roll cage. Assuming it’s equipped with the automatic transmission, Lebanon Ford claims a 10.5-second quarter-mile time is possible. Of course, other factors, such as road conditions and driver skill, also play a factor. 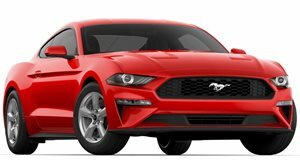 And, for the record, the LFP 10 package is also available for manual-equipped Mustang GTs, but that 10.5-second time will be more difficult to obtain. So, how good is a 10.5-second quarter-mile? The new Dodge Challenger SRT Demon makes the sprint in a claimed 9.65-seconds. Then again, it does cost at least $25,000 more than what Lebanon Ford is now offering.